Kathryn Casey is an award-winning journalist, who has written for Rolling Stone, TV Guide, Reader's Digest, Texas Monthly, and many other publications. She's the author of several previous true crime books and the creator of the highly acclaimed Sarah Armstrong mystery series. Casey has appeared on Oprah, Oprah Winfrey's Oxygen network, Biography, Nancy Grace, E! network, truTV, Investigation Discovery, the Travel Channel, and A&E. 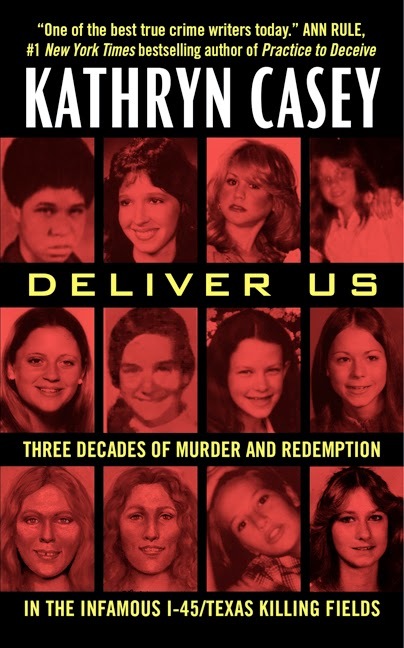 Her new book is Deliver Us: Three Decades of Murder and Redemption in the Infamous I-45/Texas Killing Fields. I’m currently reading All the Light We Cannot See by Anthony Doerr, and enjoying it. Regrettably, I’m not far enough into it to comment. I’m researching two books, and it’s hard to find time for more than a few pages a night. So I’ve decided to write on the most recent book I finished, The Goldfinch by Donna Tartt. Since The Goldfinch won a Pulitzer for fiction, obviously it’s excellent. What I’d like to explore is the theme of destiny in the novel. It’s not giving away any of the plot, since it happens early, to reveal that the main character, Theo Decker, and his mother are in an art museum when there’s an explosion. Unable to find his mother, Theo flees, but not before making a fateful decision. This action colors Theo’s future, influencing other choices, eventually leading him to his life’s career and to people who become vital to his survival. In addition, fate is played out as an essential element in Theo’s relationship with his father, a gambler, who talks at length about the role of luck. That early action, the one Theo makes shortly after we first meet him, also becomes integral to the denouement. Perhaps the reason I particularly enjoyed this aspect of the book is that I document the important role of chance in my most recent book, Deliver Us: Three Decades of Murder and Redemption in the Infamous I-45/Texas Killing Fields. This is a true crime book, and the cases it contains are real, the murders of nineteen teenage girls and young women south of Houston, along the I-45 corridor. It’s believed that these were all crimes of opportunity, the types of situations we often refer to as “being in the wrong place at the wrong time.” On those crucial days, if each of the victims had varied one simple choice, taken slightly different paths, it’s probable that they wouldn’t have died. Learn more about the book and author at Kathryn Casey's website and blog. The Page 69 Test: Deliver Us.